Put into the game in the seventh, the Royals' Luis Encarnacion pitched the final three innings. He struck out three and gave up only one hit. That one hit was a home run to Boston's Sam Horn. This was Encarnacion's major league debut, July 27, 1990. It was also the best outing of his major league career, a career that spanned just three more appearances. 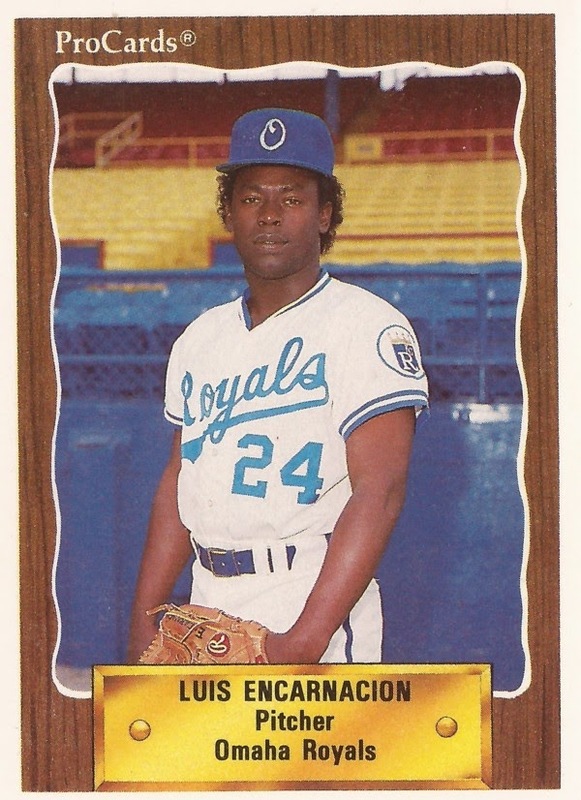 Encarnacion joined the Royals system in 1984, signed as a free agent out of his native Dominican Republic. The reliever began at short-season Batavia, posting a 3.12 ERA in 21 appearances. Going through single-A Waterloo in 1985, credited with 24 saves, Encarnacion landed at AA Waterbury in 1986. He posted ERAs just under 4 both years. With Waterbury, Encarnacion pitched two hitless innings May 27 for his fifth save. Encarnacion stayed at AA into 1989. He settled down at AA Memphis in 1988, with an ERA of 2.77. In one game, April 30, Encarnacion pitched 3.1 scoreless, hitless innings. Then, in 1989, Encarnacion dropped that ERA to below 2 for the year. Promoted mid-year to AAA Omaha, Encarnacion put up a 1.78 ERA in 31 games. He returned to Omaha for 1990, getting his break when another with another player going on the disabled list. Encarnacion got the call-up in late July, with Luis Aquino going on the 21-day DL. After that first outing, with the single hit, Encarnacion's major league career went down hill. He gave up three earned runs in his next outing, July 30, in just 2.2 innings. In 3.2 innings Aug. 3, he gave up four earned runs. Finally, in one inning Aug. 11, Encarnacion gave up one earned run in one inning. It was Bo Jackson coming off the disabled list that led to Encarnacion being set back down. Returning to Omaha, Encarnacion's 1.2 innings of perfect relief got him the win in the first game of the American Association Championship Series. He returned to Omaha for 1991, but with a 3.76 ERA that year, his career was done.